Welcome to the official blog of the Doyon Foundation, based in Fairbanks, Alaska. If you’re an Alaskan resident looking for an opportunity to learn a trade, the Fairbanks Carpenters Training Center is now accepting applications for their Carpenters Local 1243 Apprenticeship program. The deadline for applications is March 13th, 2013, and class begins May 13th, 2013. Applications are available Monday through Friday and may be obtained at 6 Timberland Drive, Fairbanks, AK. Applicants must be at least 18 years old and a high school graduate or equivalent. If you would like more information about the apprenticeship, please call the Training Center at (907)-452-4626. The Society of American Indian Government Employees (SAIGE) is a national non-profit organization that advocates for American Indian and Alaska Native Government employees. SAIGE will host their 10th annual National Training Program, Guiding Our Destiny with Heritage and Traditions, June 3-7, 2013 in Spokane, Washington, at the Northern Quest Resort & Casino, owned by the Kalispel Tribe. As part of the Training Program, SAIGE will also host the annual Native Youth Program. This program is designed to provide Native American students an opportunity to learn about careers within the federal government, to participate in professional and personal development workshops and leadership training, and to network with Native American professionals. SAIGE encourages Native American youth to realize their potential to become leaders in their communities and schools, continue their educations by obtaining a college degree, and ultimately, to seek a career in the government sector in one of the multitude of civil service professions. Federal agency representatives attending the conference will have the opportunity to participate as Exhibitors, meet students, and promote career opportunities within their respective agencies. SAIGE is offering a limited number of scholarships for Native students to attend the 2013 Training Conference June 3-7, 2013 in Spokane, Washington. The scholarships will include conference fee, airfare, hotel accommodations and meals. The Youth Program is open to Native Students between the ages of 18 and 25 who can demonstrate they are currently enrolled in good standing at an accredited high school, college or university. Students must be interested in gaining a professional degree and in the possibility of pursuing a career with the federal government. SAIGE invites American Indian/Alaska Native students to submit their application form, letter of reference, proof of school enrollment, and completed emergency medical information form for consideration to attend the conference. A short essay about their interest in government careers and information about themselves is also required. Completed application packets must be postmarked or electronic copies sent no later than April 1, 2013. To obtain a complete application visit our website at: www.saige.org under Youth Program. United Way of the Tanana Valley is hiring a new Resource Development Director. See attached position description. 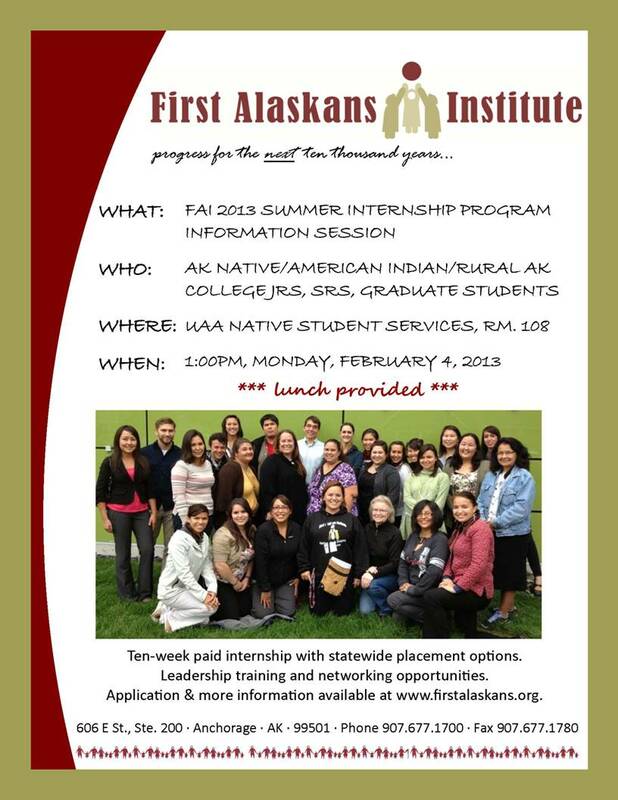 First Alaskans Institute will be at NSS Monday February 4th at 1pm to recruit for their summer internship program. Please stop by if interested. For questions, please call 907-786-4737 or email wwami@uaa.alaska.edu. If you are currently an Alaska Native eighth grader attending a qualifying school you are eligible to apply. AWE Camp is a federally funded science and math camp, which provides upcoming high school students with a unique experience to have fun, make friends and strengthen science and math skills that relate to the study of natural history and daily camp activities. Participants will interact with some of the best science and research organizations located in South-centralAlaska. For more information visit http://ageya.org/camp.php. NIDA Summer Research Program – Apply Now! The National Institute on Drug Abuse (NIDA) invites high school and under graduate students to submit applications for the 2013 Summer Research Program. Under this program students underrepresented in the biomedical and behavioral sciences are paired with NIDA funded scientists at research institutions across the United States for 8-10 weeks during the summer to work in the field of substance abuse and addiction research. Internships may involve a variety of experiences including laboratory experiments, data collection, data analysis, patient interviews, library research and literature reviews. Student interns receive a stipend, and if necessary and eligible, provisions for travel and housing expenses. Complete program information, including the application form, required student qualifications, research site locations and research project descriptions are available at: www.drugabuse.gov/pdf/sposummer.pdf. The deadline to submit applications for the 2013 program is February 15, 2013. For more information, contact Dr. Albert Avila at aavila. Subscribe to Doyon Foundation's Blog by Email and get our blog postings sent to your inbox. May 15th: Basic and Competitive Scholarships for the Fall Semester. November 15th: Basic Scholarships for the Spring Semester. March 15th: Basic Scholarships for the Summer Semester. Please visit www.doyonfoundation.com for more information. May 10 Graduate Reception Shaping up to be Better than Ever! Denaakk’e Dedeenee – Say it in Denaakk’e! OPPORTUNITY: Al Adams Young Political Leader Fellowship – Please share! Whether you are just starting your career or an experienced career veteran, Doyon is looking for individuals that thrive on challenge and are motivated by the ever-changing environments in our industries. Click on the Job Sites page at top of page to click through to the job pages at all 13 ANCSA Native Corporations as well as other job resources. The Doyon Foundation Blog features news, information, and articles we hope are helpful to Doyon shareholders and students and of interest to our donors and volunteers. Below you will see "categories" that you can click on to help you locate things you are interested in. For example, if you click "Learning Opportunities" all postings that are about learning opportunities will be presented to you in reverse chronological order (i.e. the most recent information first).